Later mining. Because the miners of the late 19th and early 20th centuries were working the malachite and azurite ores, they could remove much larger volumes of rock, even though it only contained an average of 2% of copper. 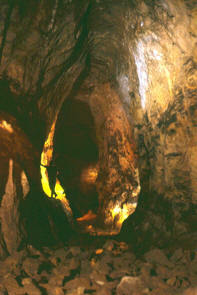 The result was that West Mine and Wood Mine developed huge stopes (caverns) which are still impressive today. 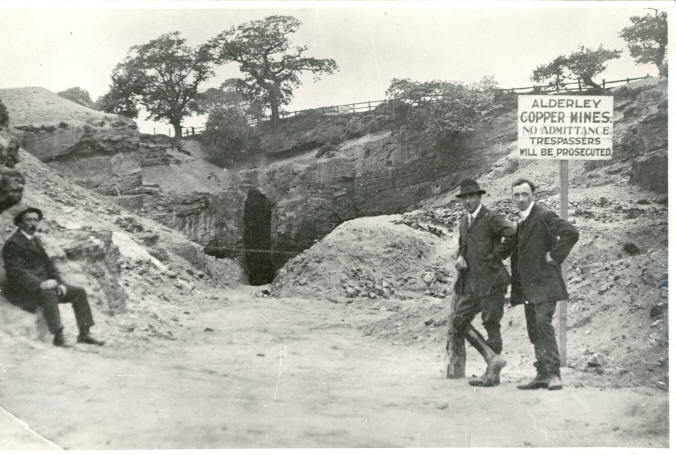 Above is the entrance to West Mine at the end of the quarry where copper ore was obtained for a while before moving underground. (Left) The Canyon passage in West Mine. This picture shows the height of the passages (note the figure, Jock, on the ledge on the left). At the top of the passage is a narrower section that probably represents the earliest trials in this area. This picture was taken in 1975 shortly after opening the mine so the floor is still covered in boulders which were later "tidied away".